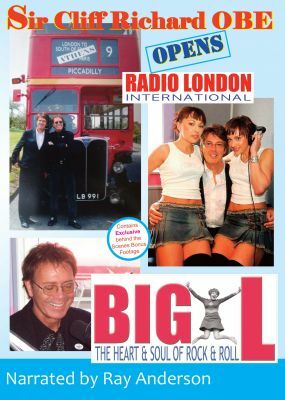 Spend a day at the launch party of Radio London International - 1395 kHz and see behind the scenes in May 2005 as Sir Cliff Richard OBE opens up a brand new radio station in Frinton-on-Sea. Sir Cliff arrives in a red London bus as hundreds of fans are in thee streets to meet him. Behind the scenes we see Mike Read, The Cheeky Girls, original Big L deejay - Ian Damon and many others. Also included is an exclusive specially recorded interview with Sir Cliff and the official 'on-air' launch. An incredible insight and behind the scenes look on this exciting day in the history of Big L Radio London. An absolute must for any Big L fan. Narrated by Ray Anderson. Available on DVD.